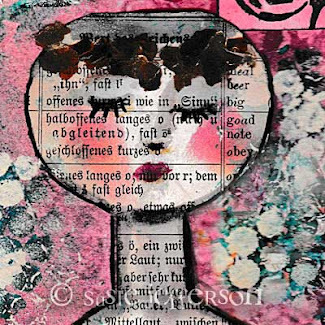 Hi gang - my TWEET wall decor piece was just shown on the TV, so I thought you might like to see a closer view! All I used was an 8in x 10in canvas, acetate and cardboard from some old packaging, a stencil and a twig! Just shows what you can do with a bit of imagination and some Structure Paste, lol. 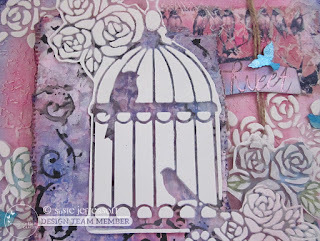 I've used Imagination Crafts Structure Paste on part of the stencil, concentrating on the birdcage and flowers - this is stencilled onto acetate and cut out when dry. 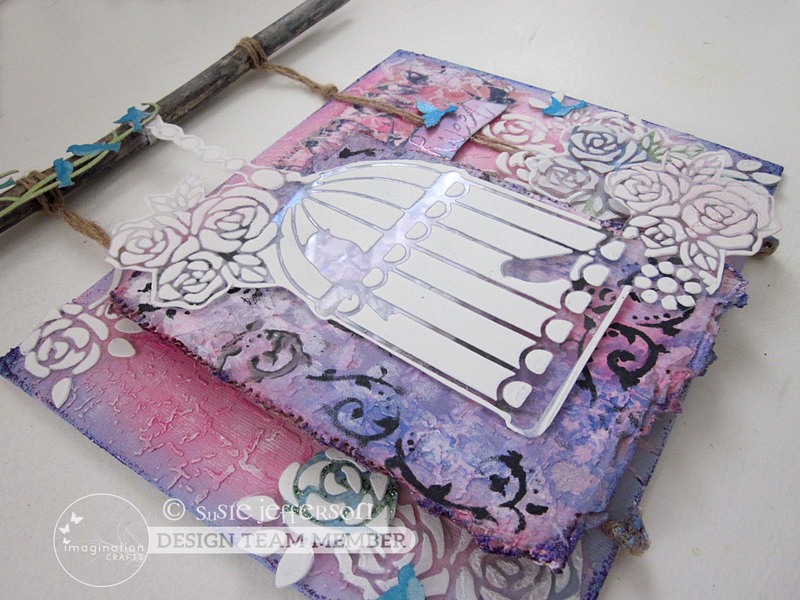 The piece is mounted on a piece of cardboard from some old packaging - coloured with Fashion Spray in blue and pink, with a swirl detail from the Dragonfly stencil pounced on with an Archival inkpad in black. 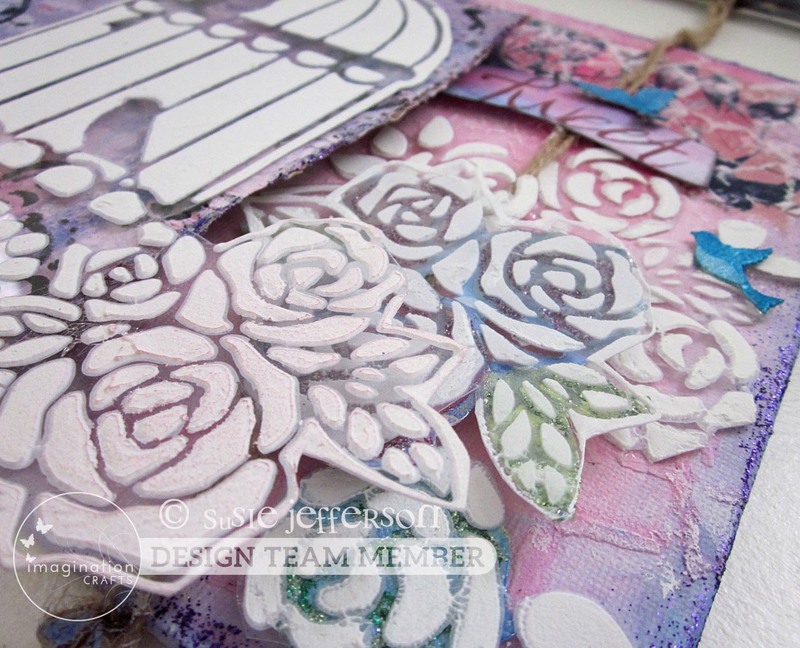 I also stencilled more flowers and cut them out (same stencil, more Structure paste) and placed them to the top right and bottom left of the canvas. 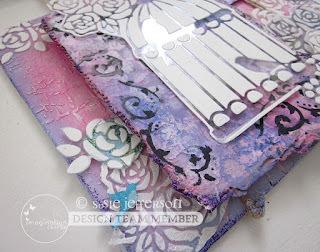 I've used the Bird & Cogs stencil from Imagination Crafts throughout, plus the crackle section from the Crackled Feather stencil (you can just see this in the background, top left). 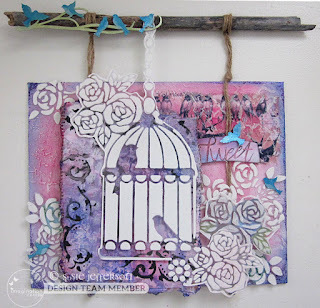 The twig - easy peasy. I looped string around the top, then tied a knot a few inches down, placed the canvas where I wanted it, then tied another knot. I repeated on the other side - and added a bit of glue for extra security, as I didn't want it coming apart later. The chain of the birdcage was a little short - so I stencilled some more, glued to the first piece and curved it over the twig, using plenty of glue gel (this needed a little sellotape until the glue set). 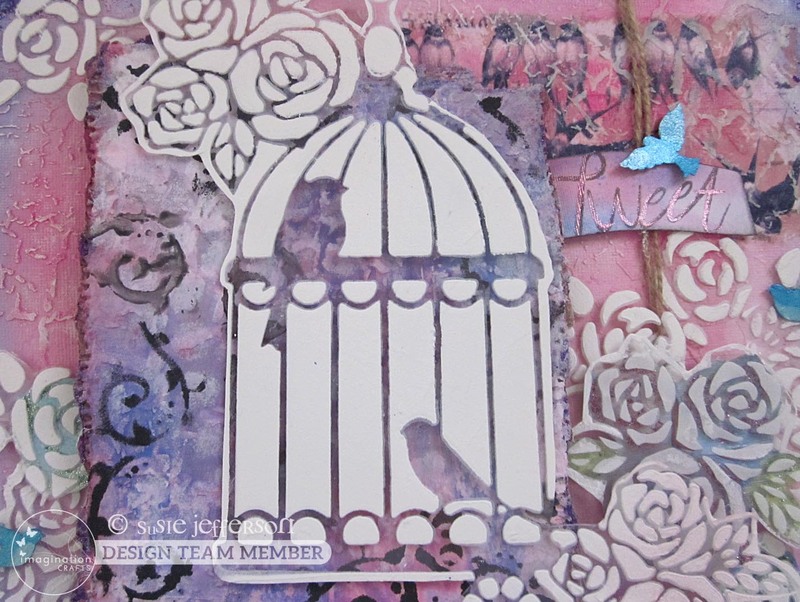 Extra little bits: Magi Cutz 'Birds on a branch' and Fashion Spray in blue, pink and white.